Syndicate Out is a cool plugin which makes smart use of the XML-RPC mechanism in WordPress to syndicate – ie crosspost – from a specified category (or optionally all posts) to another WordPress blog or blogs in “real-time”. The syndicated post on the destination site has the same categories, title and of course – content. This means yo’ll have two different sites with two identical posts. For obvious SEO reasons, this is not the best practice. With syndicated posts, you can do cross-linking and drive clicks from one site to another, but the plugin leaves up to you to solve the SEO problem in order to have a healthy appearance in the search results. Well, we’ve written a small plugin to solve this. It needs to be installed on both – origin and destination. How do we do this? We 404 the destination crossposts and we rewrite the links in the crossposts to point to the origin posts. 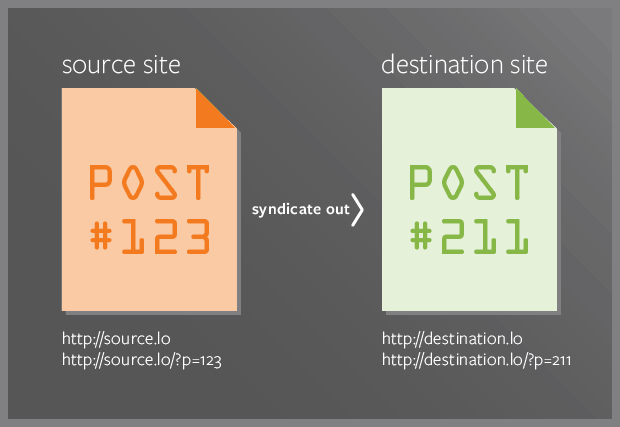 On the origin site, Syndicate Out will be configured with the destination site user credentials (make sure this user has the right to publish posts) and cross-post category. The Syndicate Out SEO plugin will add a new meta data to the cross-post (the original permalink), which Syndicate Out plugin will publish to the destination site with all meta attached to the post. On the destination site you’ll only need to install Syndicate Out SEO. Configure in Settings->General page -> the 404 Syndicate category field and you’re ready to go.